My wok is 18 years old, it was one of the first gifts I received when I moved from France to the US, back in 1995. Thank you, dear friend, you know who you are… 😉 I used it a lot in Oklahoma, even though our stove was not powerful enough to bring the best in stir-frying. The wok patiently waited for me inside a box when we traveled for two sabbaticals, and into the box it went again when we moved to the Little Apple and co-existed with an electric stove that even Benjamin Franklin would consider sub-par. Once Supernova was installed, I went to the basement to retrieve my old friend, apologized for the neglect inflicted upon him, and said his loyalty would be compensated: he would meet a superstar and they would live happily ever after… Happy to report that it was love at first flame! The day before or a few hours before your meal, velvet the chicken using this method. Heat 1 Tbs. of the oil in a wok over medium-high heat. Add the shallot slices and cook for 2 to 3 min. Add the Piquillo peppers (I buy them jarred) and cook until both the pepper and onion are browned around the edges. Remove the vegetables from the skillet; set aside. Pour the remaining 1 Tbs. oil in the skillet. Sprinkle the chicken with salt and pepper, add it to the oil, and cook, stirring frequently, so that all sides brown, 2 to 3 min. Stir in the snow peas and sprinkle in some red chile flakes. Add the ginger. Reduce the heat to medium low and stir in the thinned hoisin sauce. Simmer for 1 min. 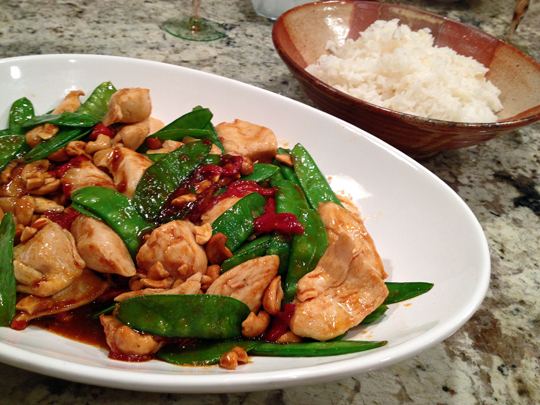 to wilt the snow peas and finish cooking the chicken. Sprinkle with the cashews and serve over rice. I’ve heard of using beaten egg whites to make shrimp crunchy and juicy but hadn’t really thought of using it with chicken breasts. The technique sounds relatively simple to manage though I am curious as to what one does if they don’t use/have wine available. I’m now regretting giving away my wok in the great basement clearout of of 2010. I am wondering if you could use a very small amount of a mild vinegar instead…. 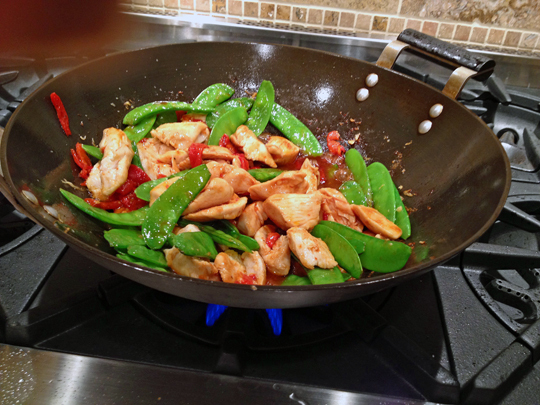 it is a texture change – when you stir fry the chicken or meat without this step, the edges can get a rough texture, the meat keeps sticking to the sides of the wok. The velveting changes all that – the term is quite appropriate actually – it softens the texture of the meat. It was a pairing made in heaven: Wok & Supernova–I’m sure you’ll be enjoying their combined efforts for years to come. And their first outing looks delicious! Good Job! I have been lax in my wok cooking, though just this week I made a beef & mushroom stir-fry on the fly with left over London Broil and on the edge mushrooms. The velveting does require pre-thought and planning–which is what I’m all about for clients but not so much for us at home! Love that new kitchen sally! Thank you! We are soooo happy with it! Once the pantry shelves are re-built and installed, it will all be done for good! Aaahhh hoisin sauce! Lovely dish! Beautiful dish. I hadn’t heard about velveting the chicken before so I learned something new! No, I did not blanch them, and that’s another interesting twist in this recipe that simplifies but doesn’t affect quality, quite the contrary. Love at first flame! That’s great. 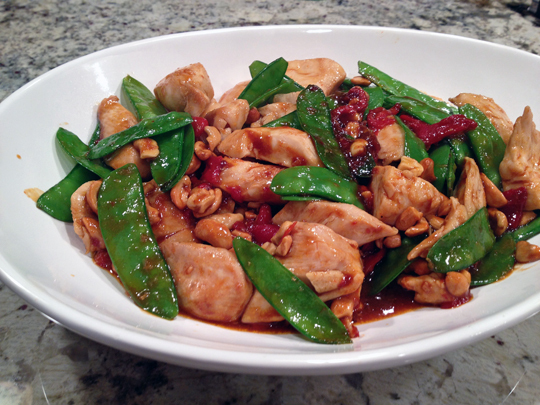 The color of the snow peas is lovely, and what a great, quick sauce! Am already trying to taste this on my palate ere I have even attempted the recipe! Interesting. Don’t think I have used hoisin alone: usually it has been one of 2-3 other sauces in the same marinade/stirfry. Also this has more chile/pepper than I ‘normally’ use. So am really looking forewards to trying it out! Hope you do try it, Eha, very simple and quick, but delish! This looks lovely and I’m forwarding it to Ryan. He just got a wok and he’s been using it right and left! Maybe this will inspire him. We’re having dinner guests on Monday and he’s agreed to cook! Thank you for sharing! I am so excited to register for a wok when the.boy and I get married. It’s one kitchen tool I’ve always wanted but have never had! I know I have a wok somewhere, but I haven’t seen it for years. The downside of house moves… This recipe is incentive to look for it! I too have an old trusted wok and a big honking’ burner on which to rest it. I tend not to reach for it very often though, but this recipe should change that. YUM! What a beautiful contrast, your brand new stove, to your first love! I believe my wok is about that old too, a gift from my dad. I’ll never part with it! I’m thrilled to see a healthy recipe as this season of indulgence takes over! As you mentioned, it’s perfect for a week night, easy enough and a healthy break!